Botan Ebi ('ボタンエビ', is classified into seafood), is known as Botan Shrimp in English, and 牡丹虾 (Mǔdān xiā) in Chinese. Large Ama Ebi, Large Peony Shrimp, Sweet Raw Shrimp, Sweet Prawn, Jumbo Sweet Shrimp, Spot Prawn. The basic size of the Botan Shrimp is about 10-20 centimeters. Toyama shrimp also known as one of the botan shrimp. Hokkaido, and Toyama Prefecture have the large catch of botan shrimps in Japan. 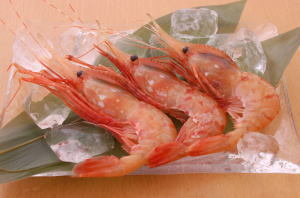 The season for botan shrimps in Japan is from November to March.